Pressure by Delta Air Lines on Alaska Airlines in Seattle continues through service additions on routes where Alaska is the dominant or lone carrier – Vancouver and Fairbanks, Alaska. The latest moves underscore Delta’s build-out of Seattle during the last year to solidify connecting traffic for its gateway to the Pacific, and the now familiar increasing competition with its long-term partner Alaska Airlines. Alaska is all too aware of Delta’s encroachment, evidenced by the recent acknowledgement of Alaska’s management that the two carriers have no plans to codeshare on Delta’s recently announced spate of new US domestic north-south markets from Seattle to feed the legacy carrier’s expanding international network from Tacoma International Airport. As it works to add service to six of Alaska’s top 10 domestic markets from Seattle by Sep-2014, Delta during the next year also plans to compete with Alaska by launching service from Vancouver to feed its international operations in Seattle. The new service not only continues to heighten tension with Alaska, but also adds a new layer of competitive dynamics to carriers offering service to Asia from Vancouver, which is just 204km north of Seattle. Delta intends to launch new service from Seattle to Vancouver during Jun-2014 with five daily flights operated by its regional partner SkyWest using 76-seat Bombardier CRJ900s. Based on a five per day, seven days per week schedule, Delta will introduce roughly 2,660 one-way seats in the market. 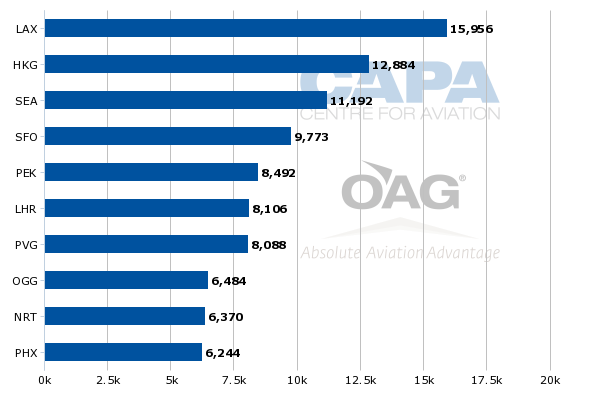 Based on current schedules in OAG (1-Dec-2013 to 7-Dec-2013), Alaska and Air Canada operate a combined 5,596 one-way seats in the market with Bombardier Q400 turboprops. 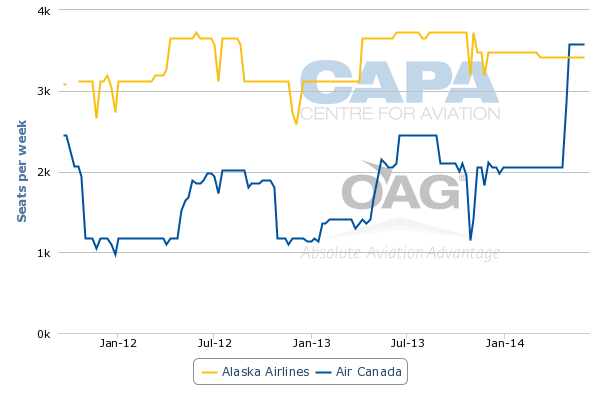 Alaska holds a 62% share while Air Canada represents the remaining 38% seats deployed in the market. Delta’s anticipated capacity additions represent approximately 47% of the total one-way seats presently on offer between Seattle and Vancouver. Routes to Northeast Asia also represent nearly 28% of the seats deployed from Vancouver, which reflects demand driven by the metro area’s large population of Chinese descent. Asian markets represent four of Vancouver’s top 10 international markets (based on seats deployed) – Hong Kong, Beijing, Shanghai and Tokyo Narita. By mid-2014, Delta will serve all of those markets from Seattle (in addition to Tokyo Haneda, which is a more attractive option for business travellers. Its other Asian destinations from Seattle include Osaka and Seoul). Given the market potential to connect passengers from Vancouver over Seattle to Asia, it was only a matter of time until Delta decided to add its own service between Seattle and Vancouver, opting to collect all the revenue on the itineraries rather than share it with Alaska on a codeshare. It is a decision Delta has made on most of its recent service announcements from Seattle, as positive commentary about its existing codeshare with Alaska has been noticeably absent from the carrier’s remarks about its “growing global gateway” in Seattle. Despite the obvious feed Delta can garner with its new Seattle-Vancouver service, it faces stiff competition in wooing those passengers from existing direct flights to Asia from the Canadian gateway. Oneworld member Cathay and Canadian flag carrier Air Canada operate service from Vancouver to Hong Kong while Air Canada and its fellow Star partner Air China offer flights to Beijing. Delta SkyTeam partner China Eastern operates in the Vancouver-Shanghai market, and Air Canada and Japan Airlines fly from Vancouver to Narita. Presumably, Air Canada can generate decent point of sale in Vancouver for its flights to Asia while Asian carriers can replicate the same scenario in their respective origin countries. At the start Delta will use the typical methods of offering deep discounts for connecting service and mileage promotions to create awareness to capture traffic for its services to Asia. But it would seem Alaska’s passengers are the more likely target of Delta’s Seattle-Vancouver flights. 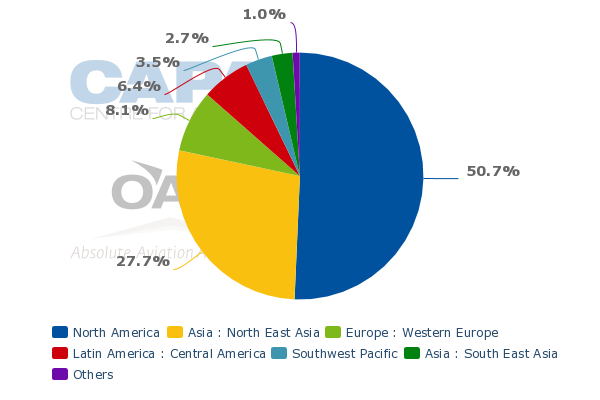 Even as Alaska is the largest carrier in Seattle based on seats deployed, its international presence is limited to transborder markets. Delta can offer Alaska’s passengers a truly global network, not only to Asia, but also to its European markets from Seattle – Amsterdam, Paris and London Heathrow (beginning in Mar-2014). In addition to Vancouver, Delta is adding its second destination in the state of Alaska during May-2014 when it launches daily seasonal flights to Fairbanks, with 160-seat Boeing 737-800s. Presently, Alaska is the sole carrier in the market, and offers approximately 3,000 one-way weekly seats on the pairing. Fairbanks could be test case similar to Anchorage, a seasonal market Delta serves from Seattle. Previously, Delta has stated it intends to increase its frequencies to Anchorage in 2014, as it works to maximise its own feed for international connections. Anchorage is a market where Alaska has faced increasing competitive pressure during the past year. Its yields on markets to the state of Alaska dropped by 10% during 2Q2013 as Delta, United, JetBlue and Frontier stepped up service to Anchorage in the summer high season. Now Delta will add to the pressure with new service to Fairbanks, as it flexes its scale to exploit all available geographies to ensure proper feed for its international gateway in Seattle. In addition to Delta’s continuing jabs at Alaska in Seattle, the major carrier is reportedly pulling its code from some existing service covered under the current Delta-Alaska codeshare. Alaska is publicly putting on a brave face, essentially concluding that the recent moves by Delta in Seattle reflect the complicated nature of airline partnerships. 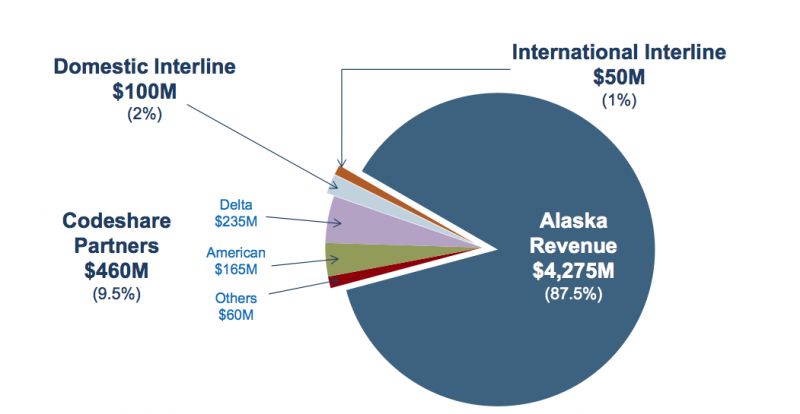 While it vows to compete fiercely, Delta is Alaska’s largest codesharing partner in terms of revenue. On an annual basis, the Delta codeshare contributes roughly USD235 million to Alaska’s revenues, and represents about 51% of the Alaska Air Group’s USD460 million codesharing revenues. Based on Delta’s consistent recent actions it seems the carrier is aiming to build out its own connections in Seattle to rely less on feed from Alaska. Inevitably, that will result in Alaska’s overall codeshare revenue dropping unless it works to expand its partnership with American, which is not likely a huge priority in the near term as American and US Airways begin their merger integration. Delta’s latest moves show Alaska will increasingly face competition in key and strategic markets from a carrier that garnered nearly USD37 billion in annual revenues during 2012. Given that scale, Delta has a strong arsenal from which to draw to keep a steady stream of competitive pressure on Alaska. But Alaska’s strong financial track record also reflects that carrier’s staying power, and its brand remains a mainstay in the US Pacific Northwest. If Delta’s blatant aggression continues, Alaska will need to pull all its existing competitive levers to defend itself against a carrier that seems to turn a blind eye to its long-standing partner in order to ensure its scheme to fully leverage Seattle is executed successfully.